Carta Brava Jr. returned after leaving in APril. Daga unmasked Suicide for the DQ. Garza Jr. replaced Fantasma. Drago beat Lider. Team Trump fouled and unmasked the tecnicos. Psycho Clown was bloodied and handicufed to the cage as Pagano escaped. Pagano earned the chance to choose the referee for their match at Triplemania, and of course picked Tirantes. 21:13. Moved to the first match. Rules were revealed to be the first four starting in the ring, someone new added every minute, over the top eliminations and the last two having a match. Argenis was the surprise luchador (though he wasn't identified as such, and came off as a replacement for someone.) Mamba, Suicide, Daga & Parka started. Parka was the last one thrown out, with Suicide & Daga lasting the whole way to face each other. Suicide got the three count after his tornillo shooting star press, though Daga's foot was on the ropes. Daga had dedicated the win to Perro Aguayo Jr. and attacked Suicide after he was given the win. The trophy broke in the process. Around 9:07, no official ending. Moved up a spot. El Apache was referee, helping the rudos early on but stopping them when Averno tried to hit Faby with a beer bottle (as Faby had done to him.) Rudos attacked Apache, preventing him from counting a Faby visual pin on Chessman. Averno hit Faby with a light tube in the back, causing her to bleed heavily from the forehead. El Apache made the save and called for the doctors. Ricky Marvin ran in and hit El Apache with a chair, causing him to bleed as well. The match had no finish or ending, and the best guess is no contest. Averno, Chessman, and Ricky Marvin are now known as OGT. 11:49. Garza Jr. replaced Fenix, who was never mentioned. Cross & London's AAA debut. Drago pinned London to win the titles in the best match on the show. Aerostar & Drago are the 17th champions. Angelico & Jack fall on their first defense; this is the second time they've lost the titles without being pinned this year. 15:05. 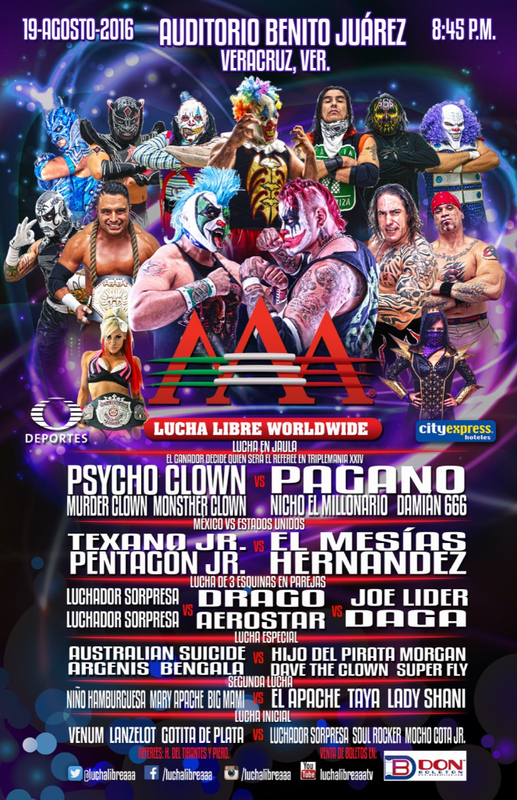 Mundo defeated Pentagon Jr. when Taya fouled Pentagon. Taya & Mundo are now together in AAA. Mundo is the 7th champion. Pentagon Jr. falls on his first defense. 11:55. Only Vampiro (as special guest announcer) and Misterio were given entrances. Rey wore Perro Aguayo Jr.'s boots, and "Perrito" on the back of his gear. Misterio beat Marty with a frog splash. 11:16. Moved up a spot. Texano small packaged Cage for the win. First defense. After the match, Hernandez, Mesias, Taya and Mundo helped Cage attack Texano. Mesias posed with the belt. Aerostar, Drago and Garza were all unsuccessful in making the save. 27:46. Extreme match, with chairs and tables and thumbtacks. Damian & Nicho ran in near the end, Dr. Wagner Jr. made the save, but fouled Psycho Clown. Pagano and Wagner lit a table on fire, then immediately were speared into the table by Psycho Clown. Psycho Clown pinned Pagano for the win. Tirantes was referee, played it fair most of the time, fast counted to help Pagano near the end, then counted the final pinfall without much of an issue. Monster & Murder Clown celebrated with Psycho Clown after the match. Wagner stopped the post match preceedings to challenge Psycho Clown to a mask match in one year's time, at TripleMania XXV. 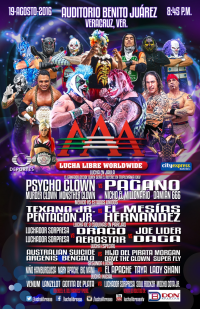 Psycho Clown accepted, and AAA confirmed it as the plan for next year after the show. Pagano got his head (quickly) shaved in the ring.